Only selected, prominent members are shown. Khagans (Great Khans) are in bold. This section is divided in a series of sub-sections for better understanding. The first part traces Genghis Khan's lineage back to the dawn of the Mongolian people, while the second part accounts for his notable descendants (ones that assumed leading roles within the Mongol Empire or later states). The first part is based on the written accounts of The Secret History of the Mongols, a literary work embedded with historical value. The second part is based on the work of several different scholars and historians (especially Rashid al-Din Hamadani), which are, in most cases, incomplete and even conflicting. The index preceding the individual's name represents the number of generations since a common ancestor (in the first part: Borte Chino; in the second part: Genghis Khan). Chagatai, founder of the Chagatai Khanate in present-day Iran, reputed ancestor of Babur of the Mughal Empire in India. Son Qara Hülëgü (d. 1252), Khan of the Chagatai Khanate 1242–1246 and 1252. Son Mubarak Shah, Khan of the Chagatai Khanate 1252–1260 and 1266. Son Yesü Möngke, (d. 1252), Khan of the Chagatai Khanate 1252. Son Alghu, (d. ca. 1266), Khan of the Chagatai Khanate 1260–1266. Son Baraq (d. 1271), Khan of the Chagatai Khanate 1266–1271. Ögedei, ruled as Khagan 1229–1241. Son Kublai, Khagan 1260–1294, founder of Yuan Dynasty in China (as Emperor Shizu). Son Timür, Khan 1294–1307, ruled as Emperor Chengzong. Son Qayshan, Khan 1308–1311, ruled as Emperor Wuzong. See list of Emperors of the Yuan Dynasty and Yuan Dynasty family tree. Son Hulagu founder of the Ilkhanate in Iran and Mesopotamia. Son Arghun, Il-Khan 1284–1291 - Buluqhan Khatan (wife). Son Gaykhatu, Il-Khan 1291–1295 - Padshah Hatun (wife). Son Tekuder (later "Ahmed Tekuder"), Il-Khan 1282–1284. Son Ariq Böke fought Kublai for Khan. Secret History of Mongols: A Mongolian Epic Chronicle of the Thirteenth Century [Yuan chao bi shi]. Brill's Inner Asian Library vol. 7. tr. Igor de Rachewiltz. Leiden; Boston: Brill. 2004. ISBN 90-04-13159-0. 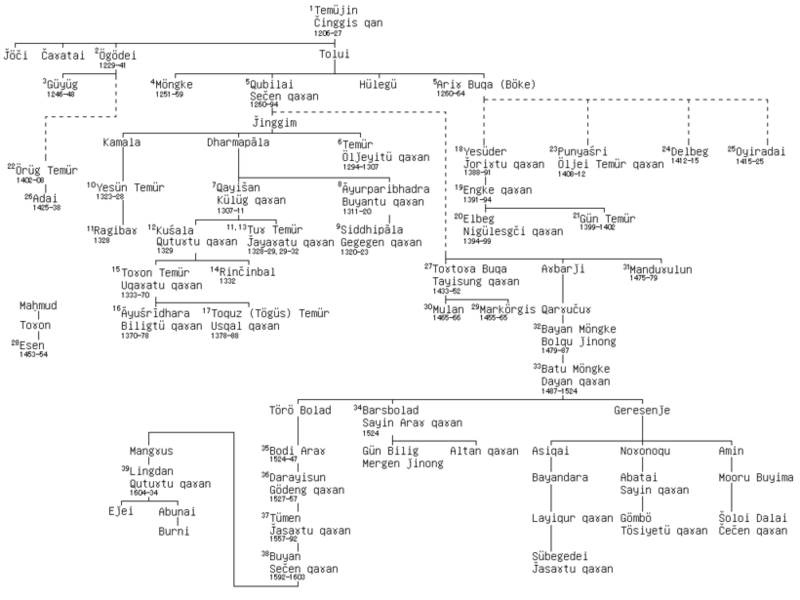 B. Sumiyabaatar, "The Genealogy of the Mongols", 720 P, 2003, ISBN 99929-5-552-X]; The genealogy of the families mentioned in this book generally goes back to 18 generations. The genealogy of Chingis Khan which began 1.500 years or 40-50 generations ago and comprises hundreds of thousands of people prevented Mongolian blood from being mixed with that of other nations. Due to the encouragement of intra-tribal marriages family lines were kept stringent. From 1920 onward people were not allowed to keep genealogical records, and the descendants of the nobles and scholars were tortured and killed. This prohibition lasted for about 70 years or three generations. 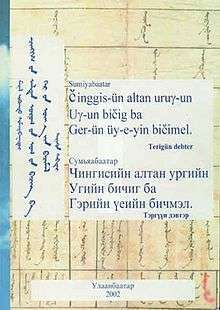 Although the keeping of genealogical records was rare during that period, Mongolians used to pass information about their ancestors to their children orally. ↑ Jochi's paternity is uncertain. It was a matter of debate during his lifetime as it is now. His mother, Borte Fujin, gave him birth within her 9-month period of captivity among the Merkit people. Despite of that, Genghis Khan always addressed Jochi as his own offspring. ↑ The ruling years of Sasi-Buqa, Erzen and Chimtai may have been as follows: Sasi-Buqa (1309–1315), Erzen (1315–1320), Chimtai (1344–1361), with the gap (1320–1344) being filled by the ruling years of Mubarak-Khwaja, who has been pointed as Chimtai's uncle, father or brother by some historians. However, recent findings indicate that Mubarak-Khwaja is actually not from Ordaid descent, but from Toqa-Timurid instead, which gives us the dates and the family tree structure observed in the main article. ↑ Following the deaths of Jani-Beg's sons, the Batuid lineage came to an end as rulers of the Blue Horde/Golden Horde. A period of anarchy (known as bulqaq in Turkic) took place in the Blue Horde and lasted until the establishment of Toqtamish’s rule in 1380. According to Ötemiš-Hājji (Čingiz-Nāma 50b: Judin 1992, p. 136), Khidr was the first to claim Saray's empty throne with the support of Taidula (Jani-Beg's mother). His Shibanid lineage was also acknowledged by Spuler (1965, p. 111: “einem Ururenkel Šybans”). ↑ Following the death of Chimtai, the Ordaid lineage came to an end as rulers of the White Horde. According to Ötemiš-Hājji (Čingiz-Nāma 53a: Judin 1992, p. 139), Qara-Nogai was the first to claim Signaq's empty throne with the support of his brothers (that later followed him). Qara-Nogai's (as Urus' and Mubarak Khwaja's) Toqa-Temurid lineage was also acknowledged by István Vásáry (2009, p. 383: “The Beginnings of Coinage in the Blue Horde”). ↑ The position of Urus and his brother Tuli-Khwaja in Jochi's family tree is controversial. Scholars and historians had previously traced them to Orda's lineage (as sons of Chimtai), but nowadays most of the academics seem to agree that they were Toqa-Temur's descendants (sons of Badik). One of the strongest arguments in favour of this change is presented by István Vásáry (2009, p. 383: “The Beginnings of Coinage in the Blue Horde”). ↑ Toqtamish seized the throne of the Blue Horde in 1380, ending the bulqaq (anarchy period) and establishing the reunification of both east and west wings of the Golden Horde. Urus had achieved something similar in 1372, but that lasted only for a short period. Furthermore, despite being Khan of the Golden Horde de facto, Urus' position was contested among the Blue Horde by that time, and he never truly promoted the reunification of both wings.